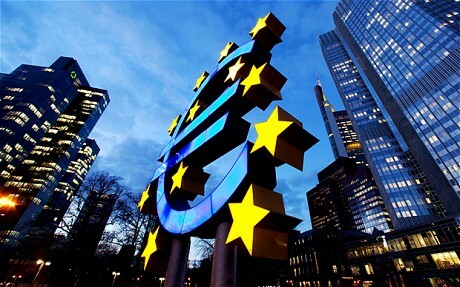 THE European Central Bank should cut interest rates and step up its bond purchase programme to support confidence and economic activity in the eurozone, the OECD has said. In its world economic outlook, the Organisation for Economic Cooperation and Development forecast that economic growth in the 17 countries using the euro will slow to 0.2% in 2012 from an estimated 1.6% in 2011. The bloc’s economy will expand by 1.4% in 2013 it is estimated. The OECD believe the continent has entered a mild recession and is the main risk to the world economy. With unemployment set to rise and inflation to fall, the choice for the ECB was clear, they said. “This calls for… in the euro area, a substantial relaxation of monetary conditions. “The euro area crisis represents the key risk to the world economy at present, with concerns about sovereign debt sustainability having become increasingly widespread,” the report said. The debt crisis, which started in Greece in early 2010, has since engulfed Ireland and Portugal and is now threatening Spain, Italy and France. Even Germany has seen its borrowing costs rise sharply. Eurozone countries are consolidating public finances to win back market confidence, but that also negatively affects their growth rates. “The euro area is seen to have entered a mild recession, which will be followed by an only hesitant pick-up in activity. “Deteriorating financial conditions and ongoing fiscal consolidation, with several countries having announced additional consolidation in the light of heightened concerns about sovereign debt sustainability, will act as a drag on the economy in both 2012 and 2013,” it said. Banks would need to be well capitalised and policies put in place for sovereigns to finance themselves at reasonable rates. “This calls for rapid, credible and substantial increases in the capacity of the EFSF together with, or including, greater use of the ECB balance sheet,” the report said.